The base of every tarot deck are the major arcana. And tarot itself is a journey of the Fool through these major arcana cards. It’s a journey towards completion, self-actualization, enlightenment. There are already a lot of descriptions for tarot cards and you can read some of the best ones in books by Hajo Banzhaf, Arthur Edward Waite, Alejandro Jodorowsky and many others. Even on Wikipedia. Here I wanted to give my interpretations and additional meanings to major arcana. To show how they are connected together and what is this Fool’s Journey is about. 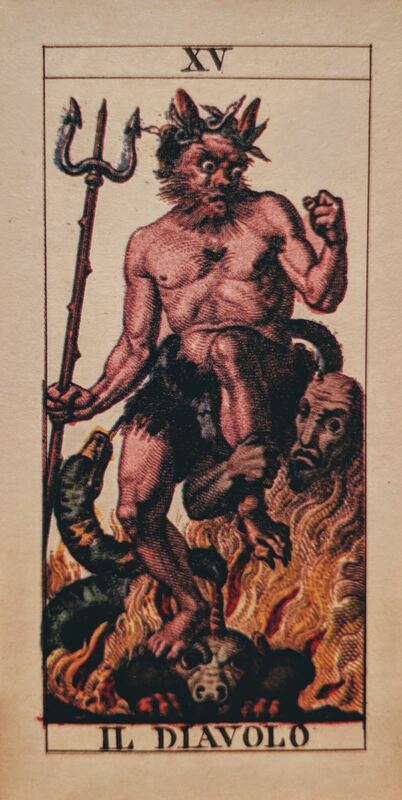 This is a guide to the Fool’s Journey through the tarot deck of Tarocco Soprafino. 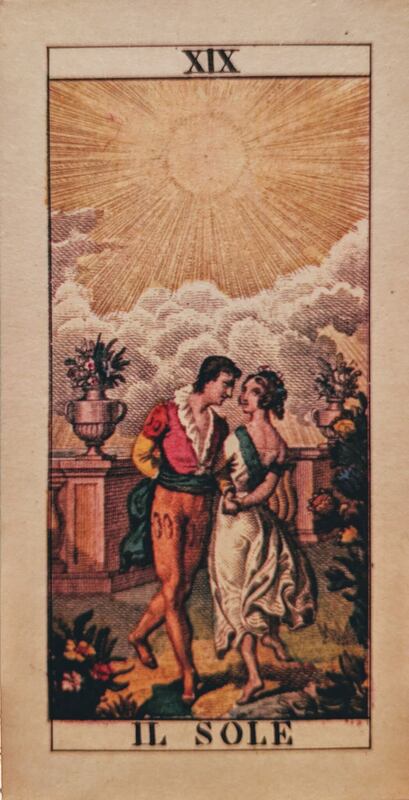 Italian tarot deck of the 19th century, it’s my favorite one: more traditional than RWS tarot and less minimalistic than Marseille tarot. The Joker card of the Tarot and our protagonist. He is a clean slate, a tabula rasa. Beginning his journey with an empty childish open mind. He moves on without any hesitation nor without any idea where he is going to. 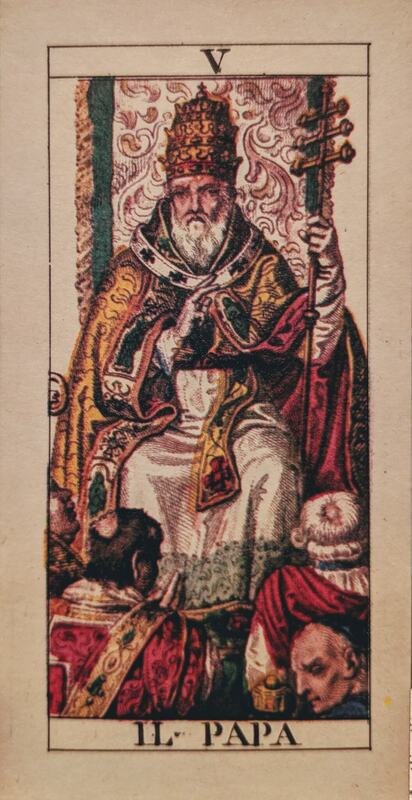 He can be the first and the last tarot card. In the first tarot decks he is Il Bagatello. A juggler, a street sleight of hand artist. Maybe even a con artist. He shows that everything starts with a trick, a magical spell, a skillful game. Magic is trickery after all. He is the spiritual father, the beginning of the journey. And the person who creates this journey as a game or a trial. 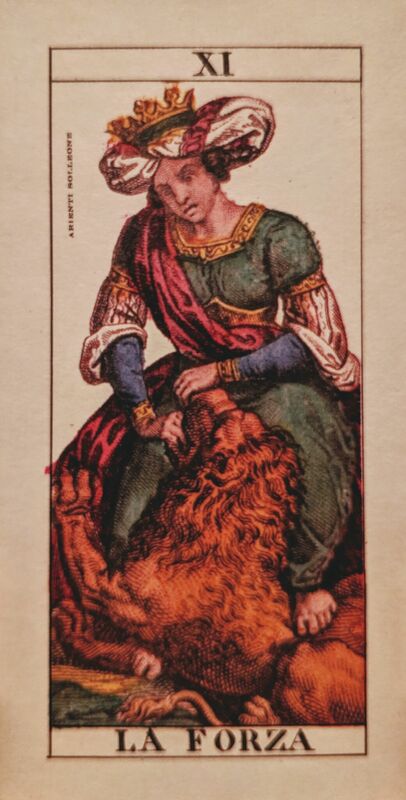 In the old tarot decks she is La Papessa. Again sounds like some trickery, because a woman can’t be a Pope. But she is, and maybe it’s also a reminder of the ancient times when women were the guides to gods and spirituality. She is the spiritual mother, but also outside of the common world, an impossible mother. She holds a book of knowledge in her hands and she can also be connected to the Moon (XVIII) card, because she has very similar energy of some hidden, insightful wisdom. Finally it’s time to be born into the world. 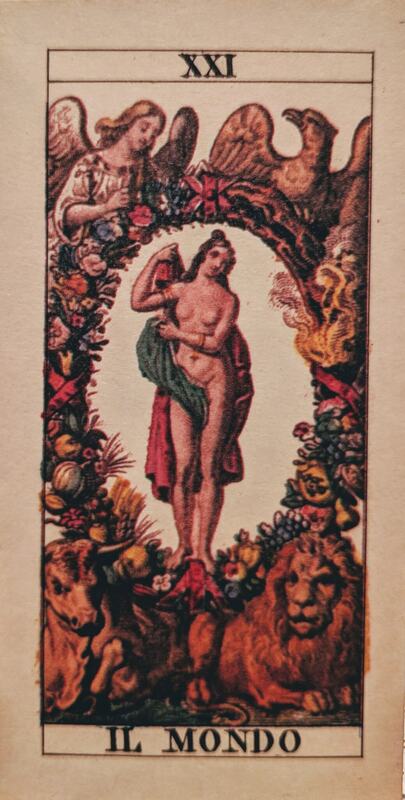 And the Empress symbolizes this archetypal Mother, the process of being born and giving birth. And this is your father, or an archetypal father figure. The symbol of power, stability and control. The ruler of the world. Also known as the Pope.  The symbol of a teacher, the person who is leading the flock. He is the first step outside of your home, but still a symbol of a strong authority and community, a guide that our Fool follows, because the Pope knows better what people should do, he unites people together. To escape the teacher and being a part of the flock you need to create your own way, your own tribe. And it opens up with finding love, finding a partner. An equal to share your life and love with. There can be lots of other meanings in this card. Sometimes a marriage or a choice between your duty and love or a love triangle. 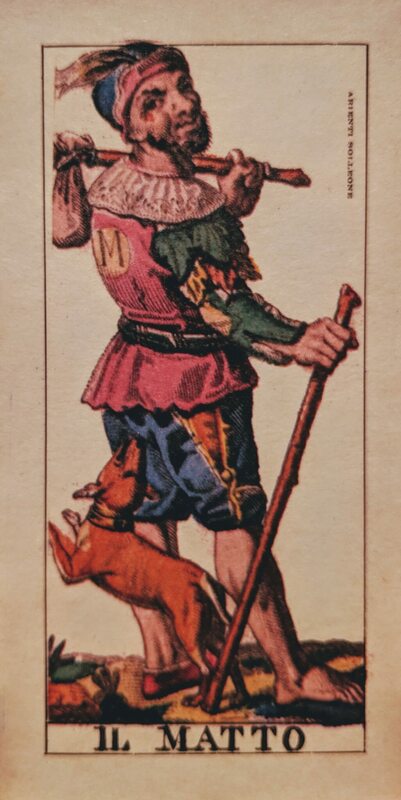 But for the theme of the Fool’s Journey it is a card of moving from community and care of your teachers to love and partners. Once you have your independence from family and teachers and you are armored with your love… it’s a triumph, a victory. You have a lot of power to be victorious in everything that you do. It’s both a chariot of coming home victorious and of going to new adventures. 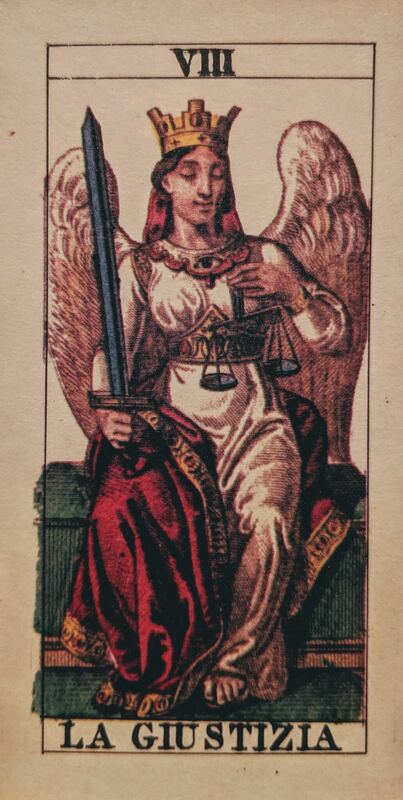 Important detail is that Justice in most tarot decks has her eyes opened. This card is about making your own decisions in life. With the power of the Chariot now you need to understand what exactly you are doing. The sword is also a symbol of big decisions that may change your life. So you need to learn to take responsibility for your actions. 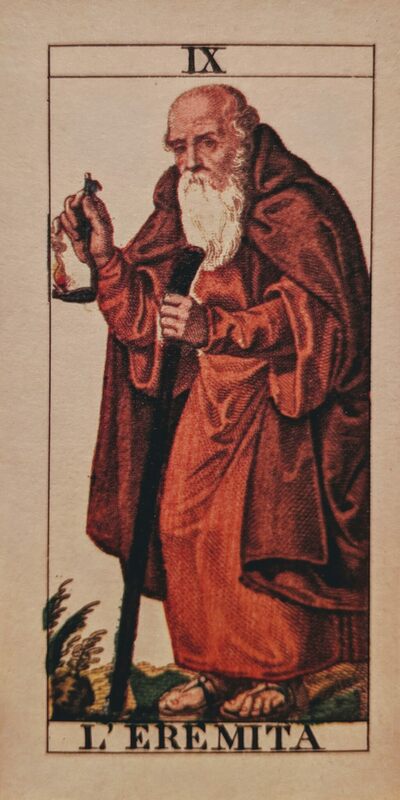 In some decks the Hermit goes from right to left. This means that he is coming from the end of the deck towards our protagonist the Fool. He brings knowledge of where to go and how to start your spiritual part of the journey. He is not a teacher, but he brings insight of where you are actually going to. Maybe he is like a bodhisattva, already completed the journey, but decided to stay here, in this world, and help others on their way. This card shows you how this world is ever changing and always bringing you new gifts and opportunities. The wheel of Samsara. You see that there’s nothing to worry about in your life and it will always go on (like the show). Life is repetitive like a wheel, but it always brings you something new to step on and move forward. The first step on the spiritual part of the journey. Strength can have many meanings, depending on what to consider Force, Power. It can be about the struggle between spiritual and material. And that spiritual (the girl) can always overpower the material (the lion). Or it can be about taming of your inner primordial force and using it consciously. This is also why Aleister Crowley has renamed this card into Lust. As a symbol of this kind of power. And to put accent from fighting it, to uniting with it. This is a card of Mind-Body dualism and maybe Immanuel Kant’s ideas on it may give you some insight. When you find this source of inner strength and control it, be it spiritual and/or material you feel how much you grow separated from the world. You see the world upside down. This is a card of meditation, loneliness, understanding of your identity. 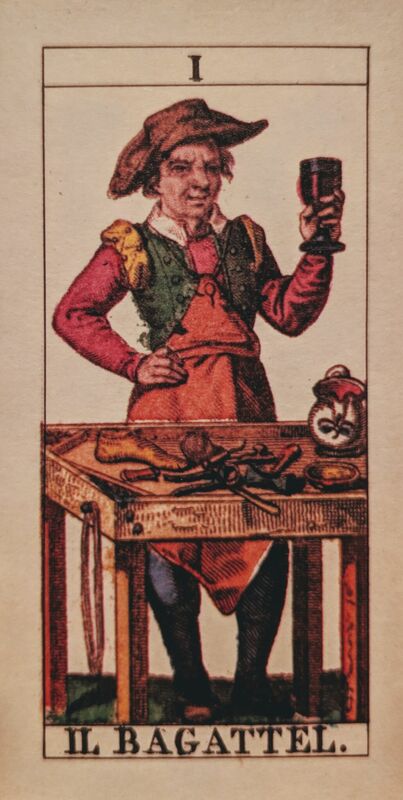 A card of a man separated from the society and the world and able to see it from a new perspective. Also it may be interesting to mention Odin, who has crucified himself on a tree to get access to knowledge. And this card also shares the same archetype. This tarot is without a name in the oldest tarot decks. But commonly it is called Death. It’s about a big purge, a fresh start. And of course it comes after the Hanged man. So you can finally start anew. That Death is like a janitor on the morning after the party, cleaning all the mess, so we can turn a new page. After death, maybe even an ego death. You are clean, free and ready to get deeper mystic knowledge about yourself and the journey. But it takes a lot of patience, the process of slow transformation from the inside to build yourself anew. This is like a holy wine aging in a cellar. A process of alchemical transformation. You have all the right ingredients, you are pure, but it will take a lot of time and a careful measurement to become what you are meant to be and fulfill your potential. The Devil is “Prelest”, a spiritual delusion. The need for enlightenment often comes from ego. To be so cool and amazing, that seemingly you don’t have an ego anymore. This is why this card comes after Temperance. The first steps on the spiritual path can be very deceitful. You feel full of power, creativity, pride. And if you are aware enough you will realize that this power comes from the Devil, that represents nature and the human nature. Our everyday world is the world of the Devil. We all come from it, and we are all made from it. Our desires, our ego, our passions, our creativity come from our diabolical nature. It can be a source of great power, but be careful not to lose connection with your soul. And your true journey doesn’t end here. Satan's promise in Matthew 4:8-9 and Luke 4:6-7 to give Jesus all the kingdoms of the earth implies that all those kingdoms belong to him. In some old decks this card is called The House of God. Obviously the first association is the tower of Babel. The temple that we build on Earth to get closer to God. And you can see it’s constant destruction after you meet the Devil. Because we can’t reach God and all our efforts will bring destruction of our hopes. This is a card of where our pride and arrogance leads us, how the biggest spiritual advancements can bring the biggest pitfalls. But in this moment of destruction we can feel the presence of God. His interference on a spiritual level. This is the moment before the fall, when you realize that you are free falling through your life. So the Tower fell down, and now it’s a start of a new cycle with the coming of the night. When we go deeper into our unconscious mind. The star is the guiding light from another world, that finally opens up the source of love inside us. As some buddhists might imagine that the emptiness, the dark night inside us — is in fact an endless ocean of love. And you open up the source of this ocean inside of you and pour it back into the world. As long as you are giving love — it will be endless. When you have found the source of love in the dark night – the Moon comes out. In the light of the moon you can see your deepest fears, nightmares, insecurities, inner demons. This is the way you can finally obtain mystical knowledge, when you open up and illuminate the darkest corners of yourself. Finally the Sun comes out. And illuminates everything, you drown in this light, like it’s the first day of earth. The Moon was your mystic mother to show the most delicate and difficult, dark details. The Sun is your mystic father it shows the world outside of you. You can finally see clearly everything that you can perceive. No more looking away, no more ignorance. Everything is illuminated, clear, simple, full of love. So you can see everything? Maybe it’s time to look at yourself and everything that happened on your journey? This is the end of days, when the dead are rising from their graves. The Final Judgement. This is you facing your past and present, going through it again and again. This moment when your life flashes before your eyes. If you can see everything clearly with the Sun it means that you have to do it and face it. This is the final trial before the Journey is completed. Like in a traditional trope where your last enemy is yourself. The end of the way, enlightenment, paradise, the world as it is. After you have become completely self-aware, purified of your sins, found redemption – the World is yours. You can see it as a paradise or as samsara again. This is the end of the deck, but also the beginning. Because no one gets finish the journey, you are just a naked clean slate in this world again after this card. And can begin your new journey as the Fool again.